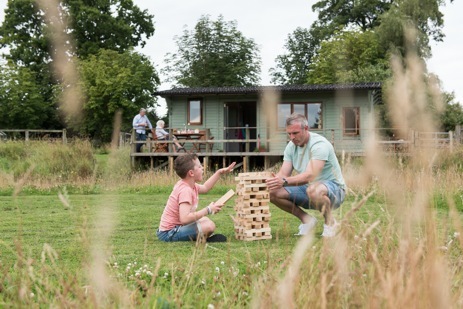 Enjoy a glamping adventure exploring the Derbyshire Peaks and Dales from Ashbourne’s Camping Cabin with your loved ones. Ashbourne is a lovely Georgian market town with a cobbled market place, renowned antique shops and charming teashops. 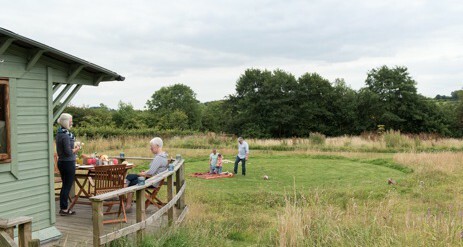 So, if you’re planning a glamping holiday to the southern Peak District you will not be disappointed with its spectacular landscapes and breath-taking views. For lovers of the great outdoors there are miles of footpaths as well as traffic free cycle ways just a short drive from the site including the Tissington trail which starts in Ashbourne, (Cycle hire available). 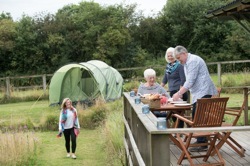 Carsington Water north of Ashbourne campsite offers fishing as well as walking, cycling routes, bird watching and water-based sports. Go Ape! 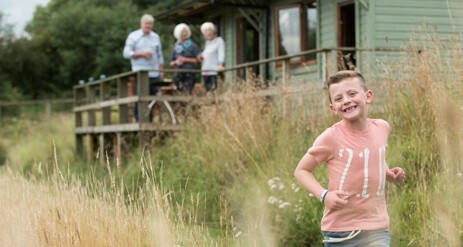 Set within the 100-acre Buxton Country Park, Alton Towers Theme Park and Gulliver’s Kingdom provide the adventure for youngster. 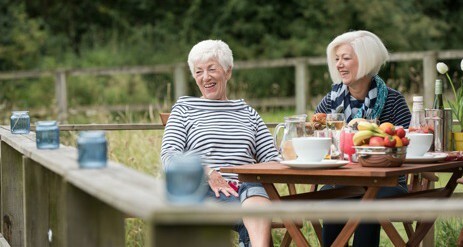 While, for a more sedentary day out, Chatsworth, Sudbury Hall, Hardwick Hall, Kedleston Hall, The National Stone Centre at Wirksworth, The Derwent Valley Mills World Heritage Centre and Denby Pottery are also all within easy reach of the campsite. heating, insulation and double glazed windows it’s cosy and comfortable whatever the weather, and one well behaved dog is always welcome. 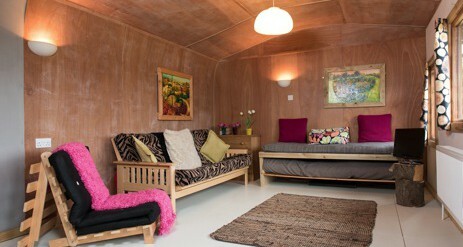 The cabin has been designed to suit everyone including wheel chair users. 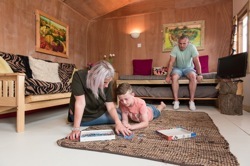 There’s easy access by a gently rising ramp wide doorways an accessible kitchen and a large level entry shower wet room means that the camping cabin is completely self-contained. 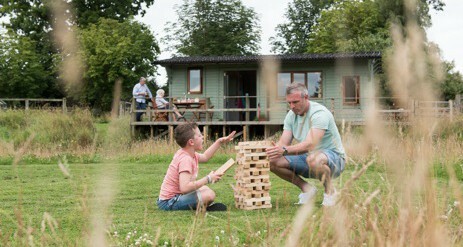 Glampers are also always welcome to use the campsite facilities including the laundry and playing field. 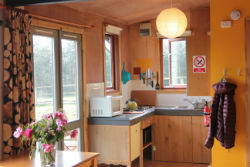 Wi-Fi is available and there is a bus stop 100m from the entrance with routes to Derby, Ashbourne and Belpher. 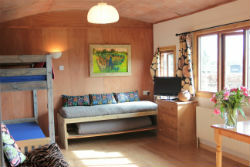 You can just arrive, lay out your sleeping bags or bedding and start your holiday. 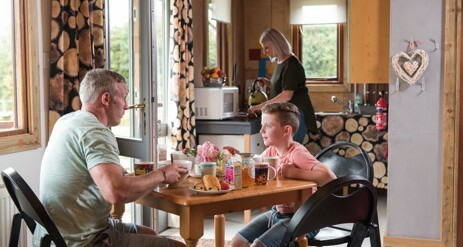 Listed below are the facilities included within Ashbourne’s Camping Cabin. Please bring your own bedding; sleeping bag/duvets, pillows, sheets, towels etc. The site shop sells locally made organic sausages, bacon and eggs, also Cowhouse Dairy Ice Cream. Belper Farmers Market runs on the second Saturday of every month. Natural Choice in Ashbourne sells Fresh Artisan bread.